This page shows the various ways to implement QuikScan. See the QuikScan Library for QuikScan editions of literary classics and other important texts. Classic QuikScan is QuikScan in its simplest form. It is very easy to implement in a word processing application and yet offers great benefits to readers. This is the way to implement QuikScan for print media. Here is a hyperlinked version of Classic QuikScan, implemented as a PDF file. 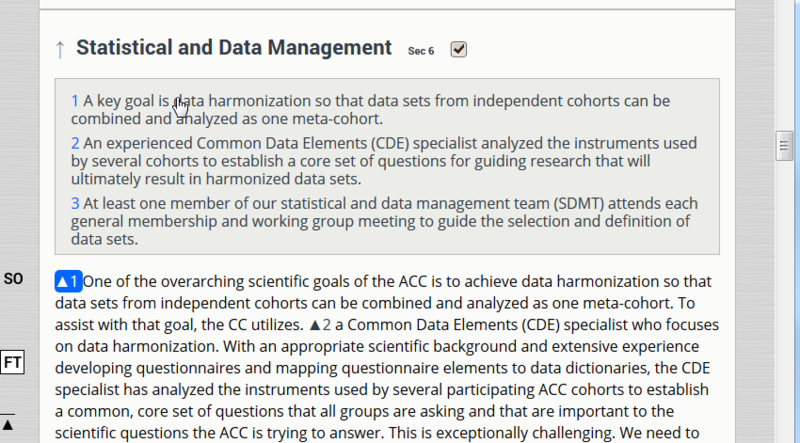 It features a hyperlinked table of contents and other convenient navigation. QuikScan Views is a full-featured web application. Using the time-saving template, authors with only intermediate-level HTML skills can QuikScan their own texts. This is a short proceedings paper. Here is a two-minute video explaining all the features of the QuikScan Views web app. Full-length books can be authored with the QuikScan Views book template. 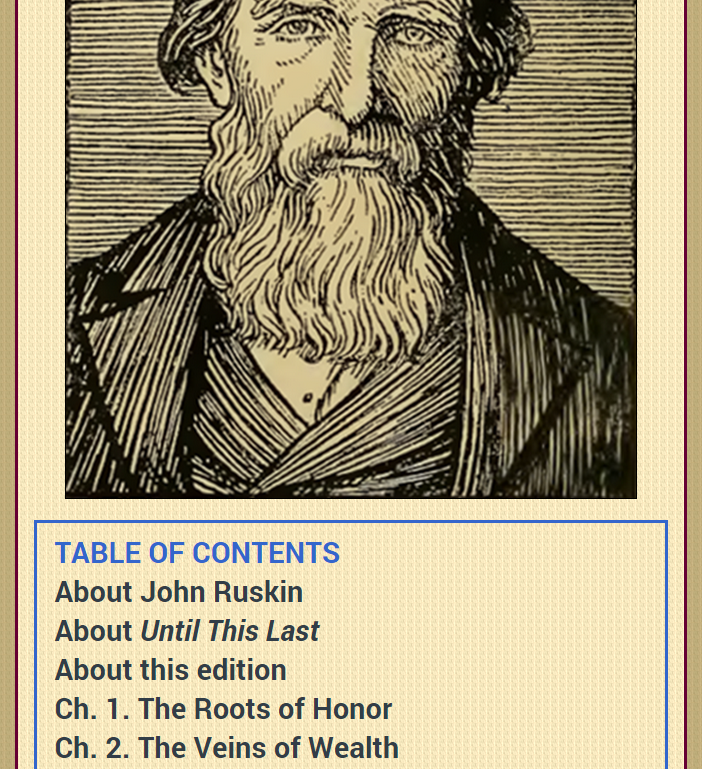 Here, from the QuikScan Library, is a new edition of John Ruskin's Unto This Last. You will notice that important passages are highlighted and the least valuable passages appear in sepia text. This special feature (if implemented) can be turned off in the Viewing Options for each chapter. Here is the full book. The ActiveReading style of QuikScan entices student readers to engage with the story through various kinds of embedded questions. In addition, instructors can enforce careful reading by treating these questions as assigned work. 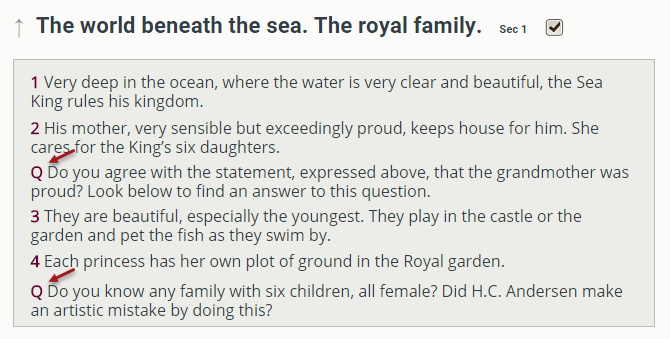 In our edition of Hans Christian Andersen’s “Little Mermaid,” there are both simple factual questions and questions that ask for deep thought. Other active-reading options include removing some summaries (and possibly asking students to write the missing summaries) and shortening the reading assignment by allowing students to read some of the summaries in place of the author’s text. Students can also QuikScan texts as a collaborative project. There are other QuikScan implementations, not shown here. For example, QuikScan summaries can be implemented as pop-ups in digital versions of QuikScan. Pop-up summaries work well if an online magazine or smilar document employs complex, irregular formatting.